SSF’s core work gives people the skills and confidence to perform in front of an audience. We train teachers to be exceptional leaders and help them build supportive, ambitious companies. 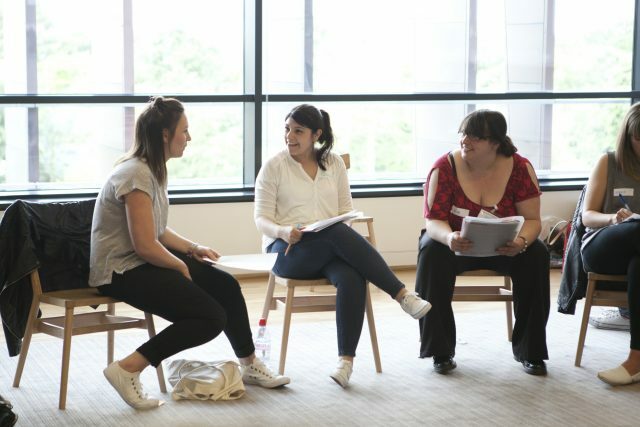 Over ten years we have honed our rehearsal room practice to provide workshops for businesses. Our client base includes EY, Google, Thomson Reuters and Ambition School Leadership. Leadership - exploring how successful managers engage and empower their teams. Team building - looking at how teams work, building trust and confidence. Presentations - considering your audience and how best to communicate with them. Creative strategy - addressing business challenges in a creative way. From facilitating strategy days to skilling up your graduate intake, we will deliver active and practical sessions to meet your specific objectives. Our rehearsal room approach will establish a safe, collaborative environment for learning and creativity to flourish. Our corporate packages are always bespoke. To discuss how we can work with you, please contact Louise de Froment, Workshop Officer, on [email protected] or 020 7601 1810. All proceeds from our corporate workshops support our charitable work, enabling us to transform the lives of more children across the UK using the unique power of Shakespeare.